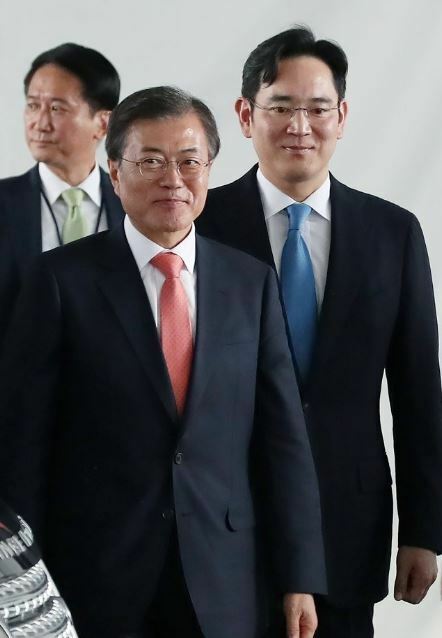 Cheong Wa Dae has invited business representatives including chaebol scions leading South Korea’s four-biggest conglomerates -- Samsung, Hyundai Motor, LG and SK -- to accompany President Moon Jae-in on his trip to Pyongyang next week, officials said Thursday without mentioning names. According to news reports, Samsung Electronics Vice Chairman Lee Jae-yong, Hyundai Motor Group Vice Chairman Chung Eui-sun, LG Group Chairman Koo Kwang-mo and SK Group Chairman Chey Tae-won were invited. But the final list of business leaders accompanying the president was not released by the presidential office as of Thursday afternoon. SK Chairman Chey appears to be preparing for the trip, while LG sent positive signs -- not a confirmation -- for Koo’s participation. Samsung declined to confirm whether its de facto leader was included on the invitation list, while Hyundai Motor said its vice chairman was reviewing Cheong Wa Dae’s invitation. The third summit between South Korean President Moon and North Korean leader Kim Jong-un is expected to focus on establishing a road map for a new economy on the Korean Peninsula, such as concrete agreements on business investments and partnerships.